CANNA Aqua Flores is a complete nutrient for plants, containing all the essential elements for optimal flowering. Aqua Flores is used in recirculating systems, such as NFT or ebb and flow systems. In the plant’s exuberant generative (blooming) phase, it is vitally important that all necessary nutrients are available directly and in the right quantities. Aqua Flores stimulates the growth of fruits and contains all necessary elements that are required during the blooming phase. For example, the plant requires less nitrogen during the blooming phase. However, the need for potassium and phosphorous is greater. Aqua Flores is rich in these elements and special chelated trace elements allow direct absorption resulting in a perfect bloom. Aqua Flores stimulates the fructification and provides every plant with its characteristic flavour. Aqua Flores is easy to use, dissolves directly and is extremely suitable for growing with re-circulating hydroponic systems. It contains pH-stabilisers, so there is no need to adjust the pH. Aqua Flores nutrition also contains silicon, humic and fulvic acids. 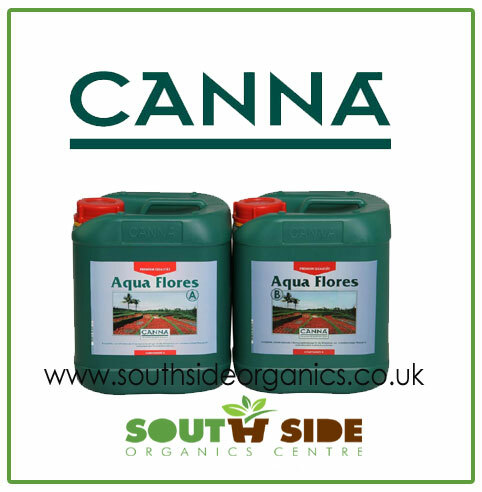 CANNA Aqua Flores nutrients consist of two parts, an A part and a B part. We separate these parts for a reason. As it happens, if some of the elements in part A and B are thrown together at the same time, they clog together. The plant cannot absorb this. That’s why you should first add the A component and then the B component. CANNA Aqua Flores is a complete nutrient for plants, containing all the essential elements for optimal flowering. Aqua Flores is used in recirculating systems, such as NFT or ebb and flowsystems.